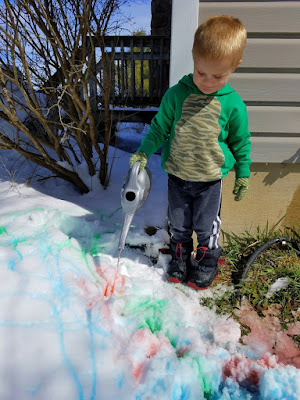 After last week’s “robin snow” (supposedly the last one of the season) and the official arrival of SPRING, you may have expected a post filled with tales of Market preparation and garden news. The week started in typical fashion, although it did include a roadtrip with Karma. Who is rapidly becoming my least favorite traveling companion. She howled for the 10 miles to the vet and then she howled for the entire return trip. I tried playing the stereo loudly, quietly…altogether silent. Nothing worked. I guess the only solution is earplugs. And, not for Karma. 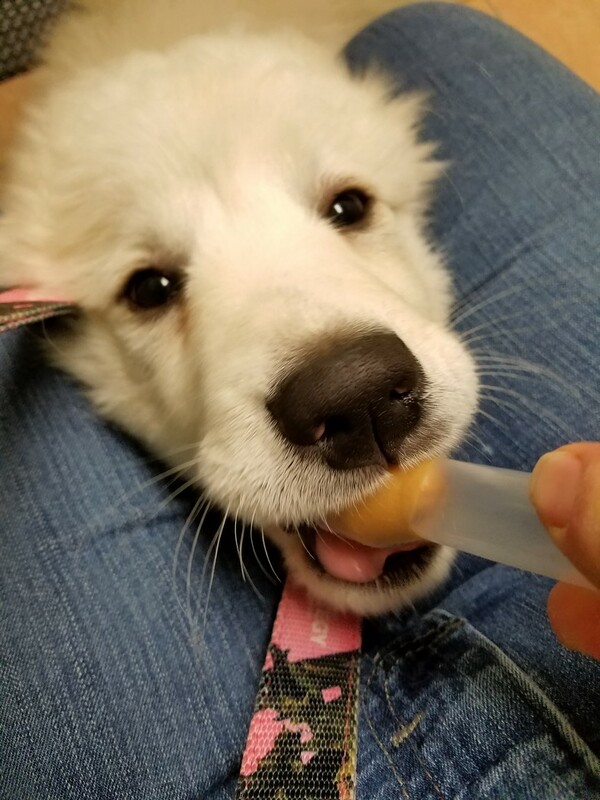 My ringing ears aside, the vet pronounced her “perfect” and gave her an extra peanut butter treat because she was just SO cute. I think Karma has a new friend for life. The week went on a rapid decline after the feed and food run. Inexplicably, more WINTER weather was headed our direction. Just in time for the Spring Equinox. Now, snow in March is not all that unusual. Snow in April is not unheard of. But, over a foot of snow on the first full day of Spring was a cold, cruel joke. Even Gus seemed disgusted with all the snowballs that formed in the fur on his big, fuzzy feet. wishing you a "Merry Spring"
"now, look, kid...my feet hurt...lay off!" The irony of a massive snow storm on the first full day of Spring was overshadowed by the knowledge that we had a batch of broiler chicks out there in the swirling snow and sub-freezing temperatures. Granted, they were in a box and the box was being transported by USPS…but, still…a lot can happen on a trip from the hatchery. We woke to a winter wonderland, and the snow only got thicker as daylight arrived. The expected time for the call from the post office came…and went. The last communication we had said the chicks were “in transit”. That meant they were on a truck somewhere between Sandston and Staunton. The storm didn’t bode well for their survival. We had just decided to call the hatchery for a replacement after the storm when the phone finally rang. It was a postal employee from the Staunton PO. I must admit I was more than a little concerned over possible outcomes of this trip. And, he wanted me to stay home and keep an eye on things here. So I busied myself to keep my mind off any pending disaster. While he was gone, I readied the chickie-pool in the shop, gathered the eggs so they wouldn’t freeze, did some shoveling and refereed in the “polar bear games”. ...and the lambs had to get in on the fun! I got a message about an hour later that he made it to town. The chicks were fine, and they were all headed home. About an hour later, the chicks were tucked up under the heatlamp and adjusting to their new home nicely. Every single one survived the trip and they are currently thriving! The Boss did have to take a detour into town where a tractor trailer had jack-knifed. The truck was none other than one of the mail contractors. No wonder the postal employee sounded worried. Thankfully, the chicks weren’t in that batch of mail! It snowed fairly steadily until late afternoon. All told, we had at least a foot. After lunch, the temperatures warmed slightly and while it continued to snow, it packed down substantially, making it much harder to blow and shovel. And, rendering our measurements somewhat inaccurate. While we didn’t incur any damage from the storm, the seed potatoes and onion sets got hung up in transit somewhere and the produce guy didn’t call until Friday. We have a trip planned to pick them up later this week. The delay doesn’t matter since it’s far too cold, wet and mucky to do any sort of garden work any time soon. But, that was okay. I spent some time with the kiddos. This isn’t the first time the weather has affected the early season and changed all our plans. And, it certainly won’t be the last. Check out these posts from the past. But, I am very glad we didn’t encounter this type of weather this time last year. This week marked one year since the Boss’ big cancer surgery at UVA Medical Center. Read this. Thankfully, the news since has all been good and he doesn’t have another scan until the end of next month. All week we were on pins and needles about a potential THIRD snowstorm. Can you believe it? Parts of Virginia did see snow yesterday. But, not this part. Good thing. Yesterday was the celebration of #1grandson’s 3rd birthday. It was so good to see everyone! It looks like that about covers it for the week. P.S. Sorry about the late posting. Had to do a little "crisis management" in the greenhouse. Some of the broccoli plants aren't looking so good. Dealing with that potential catastrophe threw my entire day into disarray. New spring, new beginning, healthy chicks, Boss having good reports - lots to be pleased about and the snow will go before long. Barbara, I keep trying to leave a comment but it keeps being returned to me as 'blocked' so I hope you don't think I have stopped answering your really interesting posts.